To order a printed copy of the HF Holidays UK Leisure Activity Tours brochure, simply click the Request button below. HF Holidays City Breaks, Festivals, Heritage Tours, Horticultural & Garden Tours, Photography Breaks and Discovery Tours. Discover the historical and cultural secrets of Britain's most fascinating towns and villages, as well as Europe's best cities. City Breaks, Festivals, Heritage Tours, Horticultural & Garden Tours, Photography Breaks and Discovery Tours all waiting to entice and educate you. Let our knowledgeable leaders help you immerse yourself in local culture, history or literature on our Discovery and Heritage Tours. Embrace the arts at one of our literary or musical festivals; or be swept away by heady scents and marvellous blooms on our Horticultural Tours around the nation's best gardens. If you love the great outdoors and exploration gets your pulse racing, now is the time to revel in natural beauty and discover hidden gems of culture and history. Discovery Tours: Discover the hidden gems of the British Isles with our friendly leaders, who will share their knowledge of the area and immerse you in the local history and culture. Heritage Tours: Discover incredible places and fascinating histories with HF Holidays' range of Heritage Tours, including art, history, architecture, railway and literary-themed holidays led by knowledgeable guides. Horticultural Tours: Revel in the cornucopia of colour, variety and beauty of Britain's best gardens. Festivals: Our opera and festival breaks are perfect for lovers of literature, music and science. City breaks: a guided city break with an HF Holidays leader is an ideal way to explore. Unlock the secrets of some fascinating European cities. Photography breaks: learn to take amazing pictures and capture the wonderful memories of your holiday. HF Holidays UK Leisure Activity Tours Brochure Claire C. said: All ok, but not for me. 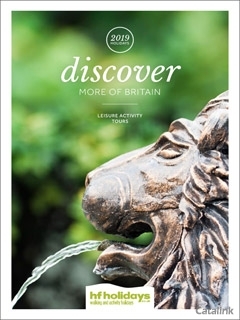 HF Holidays UK Leisure Activity Tours Brochure Cheryl L. said: A lovely brochure! HF Holidays UK Leisure Activity Tours Brochure Barbara H. said: Love idea of learning something new . I like holidays where I am occupied and not just sunbathing. By pressing the Request Printed Brochure button you give consent to HF Holidays UK Leisure Activity Tours (and their Data Processors for the specific purpose of delivering your literature) to send you their Brochure .